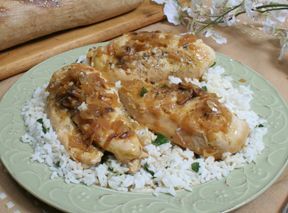 "I got this recipe for somebody else from this website because I loved it. 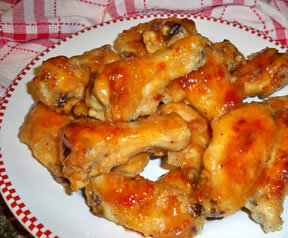 I ... read full review"
Coat wings with flour and sprinkle with garlic salt and pepper. Bake on greased cookie sheet at 350° until brown. Put in roaster. Mix all ingredients and pour over wings. Bake until sauce thickens. 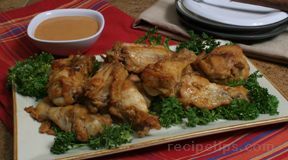 You may have to double or triple sauce recipe depending on how many wings you make. "I got this recipe for somebody else from this website because I loved it. I have made it for events and get togethers and I have never had so many compliments on anything else as I have on this. I have given the reipe out about 6 times now and have had it for 2 events. I am making it again today for another." 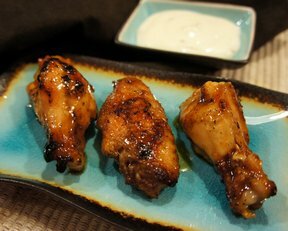 "My wife made me find the appetizers for a small party we were having so I tried this wing recipe. After I browned the wings, I placed them in a slow cooker. Then I boiled the sauce ingredients in a saucepan until the sauce thickened and then poured it over the wings in the slow cooker. I let them cook about 2 hours on low. They were easy to make and all our friends loved them."